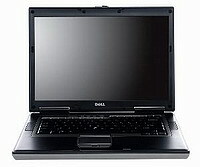 The Dell Precision M90 and Dell Precision M65 are using Intel’s 945PM chipset and feature up to 4GB of 667MHz DDR 2 SDRAM. Dell is offering the machines with Core Duo CPUs ranging from the T2300 to the T2600, and up to 120GB of 7,200rpm Serial ATA hard disk storage. The M65’s 15.4in display is connected to a Quadro FX Go 350M with 256MB of memory. Dell is offering native resolution options of 1,680 x 1,050, 1,920 x 1,200 and 1,280 x 800. Both machines ship with a Trusted Platform Module security chip ready to work with the integrated smart-card reader – which ships as standard – and an optional fingerprint scanner. They also include 802.11a/b/g Wi-Fi. This entry was posted on Thursday, April 6th, 2006 at 9:20 am	and is filed under Laptops. You can follow any responses to this entry through the RSS 2.0 feed. You can leave a response, or trackback from your own site.